VIVA China has been officially incorporated into Columbia China’s Corporate Social Responsibility (CSR) in 2017 as a commitment to improving China’s healthcare services. Together we believe and dream for the day in which no child’s life will disappear in the dawn of life. VIVA China Children’s Cancer Foundation Limited was set up set up on December 17, 2014 to provide an infrastructure and be a conduit to receive all the knowledge from advanced centers of medical research and treatment overseas and transfer to China to improve the cancer cure rate for children. Our mission is to save lives of children with cancer through excellence in medical care, research, and education. VIVA China’s first project is to create a platform for doctors at 20 hospitals in China to congregate their data and share them amongst the hospitals on an ongoing basis. By focusing on improving research, as well as empowering scientists, doctors and nurses to develop better cures, VIVA China believes that it can offer children with cancer a better chance of being cured and surviving well, by ultimately changing how children’s cancers are being diagnosed and treated today in Asia. Cancer is the major cause of childhood death in China. Out of the 50,000 new cases per year, 15,000 are ALL cases. Currently in China, the cure rate of childhood ALL is estimated to be 40%-60%. 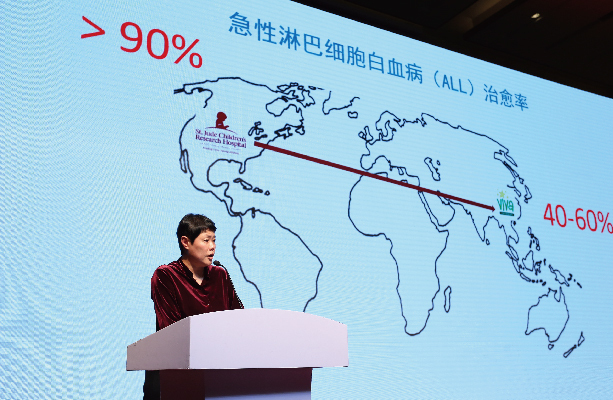 VIVA China aims to bring the high cure rate of more than 90% achieved at St. Jude Children’s Research Hospital into China, by enrolling 1,250 new cases through 20 participating hospitals in China. To date over 3,500 children have benefitted from this platform.